We offer a full range of services for emergency lighting testing and also offer maintenance to keep them in working order. Yearly and quarterly Emergency lighting testing inspections along with regular maintenance with official certification. Full Visual Inspection & Technical Driven Testing of each of the emergency lights to check they will work in the most dangerous situations that could happen. Reporting will include an in-depth report outlining the condition of your emergency lights and a plan to bring them up ot standard if any faults were discovered. An official certificate will be issued to verify that you have had your emergency lighting systems tested and that they are up to regulatory standards and requirements. Emergency lighting testing is absolutely crucial so understanding what it is, why it’s needed and most importantly what you get from testing is essential for making a good decision on it. What If There Are Fails? Is It A Legal Requirement? We offer 2 different packages when it comes to Emergency Lighting Packages which cover testing. Full Year Package – This our most detailed package available. It includes one 3 hour test once a year, with an additional visit every 3 months. This will give you 4 visits per year ensuring your emergency lights are always working. 4 tests a year is also the legal requirement. Detailed Initial Inspection – A visit that will involve a full assessment of lighting systems that have not been maintained for quite some time. We will develop a full plan on how to bring the lighting up to standard so you are protected. Keep your business and your staff safe from dangerous injuries caused by emergency lighting not working. Having your building tested allows you to show that you were being safe and cautious about emergencies. You can rest easy knowing if there was an emergency that your emergency lights would light the way out every time. Keep your business legally compliant with the Safety, Health, And Welfare Law. The majority of Irish Insures now require that you have your emergency lighting tested on a regular basis to prove your building is safe in case of accidents. Keep your staff safe at work, don’t allow a chance that those lights won’t work in case there is an emergency. It is a legal requirement for businesses to have emergency lighting testing carried out 4 times a year in order to prove that the building’s emergency lighting is safe and working order. Emergency Lighting must be tested 4 times a year. The standard approach is to test the lighting every quarter with 4 visits a year. After emergency lighting test, we will issue you with detailed reporting outlining the health of your emergency lighting. The report will also outline the faults found and any action needed to repair these faults. You will be issued with a certificate of inspection in order to show your compliance with regulations. In the event of any failures, our electrician will detail these in the report outlining the details of the failure and the action needed to repair it. We can on request also quote to repair any fails that appear during the inspection. Yes, having emergency lighting testing carried out regularly is a legal requirement under health and safety regulations here in Ireland. It is required that lighting is maintained while also be testing at least 4 times a year, which usually involves a test every 3 months. We can facilitate emergency lighting testing during hours for small properties and will work around your schedule to fit in testing at the best time for you. We also offer testing in the evenings and weekends if this is a more suitable slot for testing.  We are safe electric registered electricians with highly skilled and professional trained staff in all areas of electrical safety and engineering. We offer free quotations on all of our electrical services. We can even carry out site visit estimations virtually within minutes for all of our services including Pat Testing & Periodic Inspections. We offer a full suite of electrical services including electrical safety services and general electrical engineering. Learn more about our electrical services today and what we can do to help you protect your business. Periodic inspections carried out by highly trained electricians who will find any electrical dangers in your building. Our professional Pat Testing service comes with detailed reports and an official certificate of compliance. With 30 years of experience in electrical services, we are always a fantastic choice for all your wiring needs. Do you need help with your electrical safety? Fill out this form to get in touch.